From Ian Holm’s portrayal of Ashe in Alien to Brent Spiner’s Data in Star Trek, our fascination with realistic Artificial Intelligence has evolved over time. The premise is certainly not a new one, but it still touches us at a primal level: What does it mean to be human? The old adage of “if it looks like a duck and walks like a duck…” is ultimately one of identity and identification. If it looks human and acts human, well… That’s a question that has tripped us up for decades. 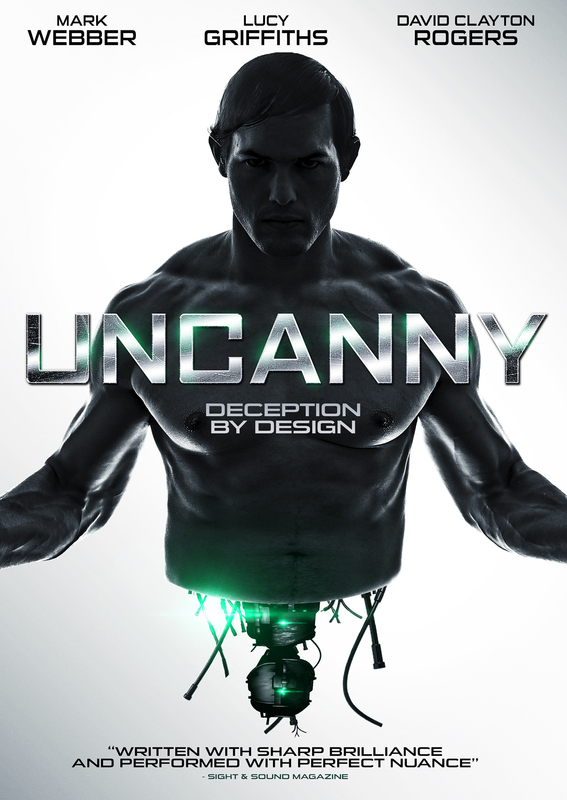 UNCANNY is the story of a gifted young scientist, David (Mark Webber), who has spent the last 10 years of his life willingly locked away in a Tony Stark-esque candyland with state of the art technology creating the most realistic artificial intelligence the world has ever seen: Adam (David Clayton Rogers). Funded by the mysterious Mr. Castle (Rainn Wilson), all’s well in this little tech Biodome until Joy (Lucy Griffiths), the reporter brought in to do a story on Adam, arrives. Emotions flare and tensions rise as a male robot with developing human emotions, an emotionally stunted male scientist, and a techno-obsessed former-roboticist female reporter are in close proximity for a week. UNCANNY is, at its core, a good story and a solid premise. The filming and visuals are executed well, and the acting is solid. The limited cast does an admirable job of dealing with the cumbersome dialogue, which follows the tradition of Star Trek with its pseudo-science technological banter. The ambient audio seems to fade in and out oddly for much of the film, which is slightly distracting but remains a mild nuisance at worst. By and large, it is a polished production speaking to the talents of those involved. Without giving too much away (as ultimately it is a film dependent on intrigue), this movie is designed for one purpose, one specific moment. “Deception by design” is the tagline, and UNCANNY is more committed to deceiving the audience than remaining true to its intriguing premise. It explores the well-trod sci-fi ground of existence. It at times pushes for something akin to an answer to the question of illusion. However, it too often relies upon all-too-familiar and expected tropes – chess, eastern philosophy/religion – without delving much deeper. But as we all know, an illusion is only as good as the illusionist. The relationship is built on trust and a suspension of disbelief. And this is where UNCANNY falters. The film remains so faithful to performing its trick, sacrificing everything to convince the audience of the illusion it is creating, that it fails its characters and the basic logic of its premise. The trust is broken at the expense of the gimmick. But is the trick any good? Is the illusion worth seeing even for that brief moment where belief was as of yet no consequence? In short, yes. For many viewers, this film will be an entertaining and worthwhile experience. Once. And once you’ve seen the trick, you will either forget it, or if you decide to delve deeper, you will see the strings, the manipulations, the forced falseness of the reality. It is a strong idea that has been stretched too thin. Characters are setup to be more interesting, to have depth, but they never reach their promise. Potential foils – a tech-loving woman that has lived a life of rich experiences but regrets leaving the field of robotics is forced into close proximity with a man that has barely experienced life and has given his humanity to developing artificial intelligence – are thrown into an unnatural love story rather than given room to explore their issues. One has lived, one has barely left the apartment. But what is life, what does it mean to create? If you believe in the illusion, does that make it real? UNCANNY dances around the question. Hints of answers on the periphery seemingly ignored for the sake of cheap parlor tricks meant to distract (or show off an intelligence that fails to live up to its own expectations) rather than enlighten. UNCANNY provides for an enjoyable evening, with solid acting, good visuals, and an interesting premise. It’s not as clever as it thinks, but it raises enough questions to be of interest and is not without intelligence. If the film were more honest with itself and the audience (and treated its characters more fairly), UNCANNY would have been rather impressive. Ultimately, one can’t help but feel that it would have made an excellent short. As a feature, it has value but does not merit more than one viewing. SYNOPSIS: For ten years, inventor David Kressen has lived in seclusion with his inventions, including Adam, a robot with incredible lifelike human qualities. When reporter Joy Andrews is given access to their unconventional facility, she is alternately repelled and attracted to the scientist and his creation. But as Adam exhibits emergent behavior of anger and jealousy towards her, she finds herself increasingly entangled in a web of deception where no one’s motives are easily decipherable.